Vertigo or dizziness is a perception of spinning sensation due to dysfunction of the vestibular system which is responsible for maintaining balance of body. This is typically associated with migraine and presents with nausea, vomiting and headache. 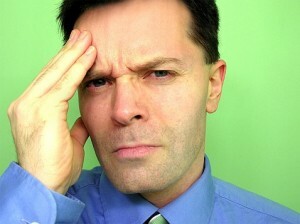 The dizziness may occur before or after an episode of headache. In some cases, dizziness may occur independently without any association with headache. Patients may have difficulty in standing or walking due to vertigo. Migraine is more common in women. Clinical studies have shown that vertigo is associated with about 30% cases with migraine, though it is difficult to determine how vertigo occurs in these cases. Many causes have been proposed. About 80% of patients have a positive family history suggesting a hereditary or genetic cause. Certain stimuli may precipitate an attack of migraine; these are called triggers and they stimulate release of chemicals in brain. These chemicals may be the reason for vertigo. Another study proposed that in patients with migraine, the blood flow to the brain is reduced during an episode. This reduced blood supply may cause failure of the vestibular system which results in vertigo associated with migraine. Migraine is more common in women, however it can affect man as well. The patient assessment by a neurophysician is essential. The diagnosis is done based on the history of dizziness in patients with vertigo. A lot of highly specialized tests are available for the assessment of the vestibular system which controls body balance. An optimal testing protocol should be followed. Some of the tests include video-oculography, video electronystagmography, computerized dynamic posturography and Vestibular Evoked Myogenic Potential (VEMP) testing. This leads to the assessment of limitation of activities of daily living. A multimodality treatment approach is required in patients with migraine associated vertigo. This includes changes in lifestyle, postural balance exercises and medications. The treatment plan is discussed with the patient. Lifestyle changes – many patients are benefited by avoiding certain foods which act as triggers. These include cheese, processed meats, chocolate, nuts, tea and coffee. A careful history is required to identify the food which is then avoided. A dietary advice is of great help to the patient. Dietitian can provide advice regarding various dietary changes. Regular exercise boosts the normal physiology and body immunity. It also helps in reducing mental stress. Yoga and meditation also result in relaxation. Oral contraceptives may act as triggers in young women. They should consult their gynecologist to decide on suitable or alternative method of contraception. A regular meal habit and sleep pattern should be reinforced to strike a balance in diurnal rhythm of body. Postural balance exercises – this mode of treatment is provided by vestibular rehabilitation therapists. Any sudden movement may result in vertigo in these cases. A controlled exercise plan to improve the postural balance is required. In this method, mild symptoms are provoked intermittently which results in desensitization of the vestibular system. In some patients, visual stimuli can cause vertigo. Such situation may arise while travelling or using escalators. These patients are given tailored visual exercises to desensitise the visual system. These exercises result in significant improvement in vertigo. Medications – medications are prescribed to prevent migraine or to treat an episode of migraine. They should be taken under medical supervision. Some of the commonly prescribed medicines for prevention of frequent episodes of migraine include propranolol, calcium channel blockers and antidepressants like amitriptyline. Drugs commonly used for treating migraine are ibuprofen, isometheptene mucate, and the triptans (sumatriptan, rizatriptan, naratriptan, zolmitriptan). These drugs act by blocking the action of serotonin or prostaglandins. Migraine associated vertigo is a well-known entity. It is diagnosed by excluding other causes of vertigo. A proper assessment by an audiologist, neurophysician and an ENT specialist is required for management of this complicated condition. ← Meningitis shots – how effective are they?